A collation from the king of modesty talking about himself, on how he knows more than just about anybody on a wide on just about anything. Its just taking folk a long time to realize he is a genius, a stable genius. His military General one the other day was hilarious. Folk need to stop taking him so seriously and just have a giggle and given 312000 jobs were created last month, the economy is growing at 4% and wage growth is pretty strong its probably preferable to say living in France with 10% unemployment but a smoother sounding less alarming President. The fallacy in that analysis is that dropping the unemployment rate gets harder the lower it gets so Trump’s achievement in continuing to press it downwards is greater than the comparative percentage decreases he has made. Seeing as you bring it up Obama was printed a trillion or so dollars to get those results and Trump is achieving it against a tightening Fed and while he is putting the US on a fairer footing with their trading partners and the government is shut down. But he is a genius and a stable one. Entertainer in Chief while also running the country. Running or ruining the country? He’s been doing it for two years already so he must be a slow ruiner. Obama did such a fabulous job following the GDC that even Trump can’t ruin the place in less than two years. Uptick, as I can’t do these now. I don’;t know what will be causing that, he doesn’t seem to be doing much out of the ordinary – except perhaps being involved in the Government shutdown. Hardly a dive. More like a small drift. AW , you do know that (like the DSM,) you only need 4 -5 characteristics out of 8 or so to be classified as a right winger. Total defence of Trump ? Thats one. I couldn’t care less about anyone’s classification, Duker. I only care whether my comments are factual and sound or not. As soon as folk like you divert to irrelevancies I know I am on track. Its no ones classification. Just a standard method of categorization. You only need ‘a majority of the attributes’ to fit the definition – in this example its right winger. Not meeting every single one is fine, but still doesnt change the category you are in. Doesn’t change my category of “Twit” for you either, Duker. I too have what some might say are ‘right wing views’, but only a few so doesnt count. I legend in his OWN mind… BUT who is the real fool: ‘the Fool’ OR the one who follows him/her ? Would it be a blessing or a curse to know as much as DT. Nothing left to learn, no one to learn from, curiosity; a redundant concept. Sounds dull and boring. He’s just baiting the Left, arty, and having a bit of straight-faced fun doing it. I can relate to that. Come off it, Duker. The man’s not stupid. He knows what he’s doing. No he wings it a lot. Even he says he works off a gut feeling. And he’s got plenty of space there for those feelings these days. yes Trump is that stupid . he really believes he knows more than everyone else. he was saying it long before he even ran for president. Senior aides have said hes a ‘moron’ and that isnt said for effect either. Another Lefty academic wanks for his echo chamber. At least he’s not publicly doing it on local and international stages, and on Twitter, all the time, like your hero. Google him. He pretty much is. Google ‘idiot’ and see what comes up in images. I guess only an idiot would search for another idiot. Yeah, I dunno. All I did was google “idiot” and see what came up in images, though. Could’ve been a baboon or something for all I knew. I wasn’t searching for any just finding out what images came up. Why do you think only an idiot would search for an idiot? I don’t think idiots probably even realise they’re idiots. Because they’re idiots. I think it’s more likely non-idiots would search for idiots. So they know who to larf at or not give jobs to or whatever. Anyone who searched “idiot” to find who not to give jobs to would definitely be an idiot. So would most who wanted to find an idiot to laugh at. They could just have used a mirror. Your method may not suit everybody else. Nice try but no banana. I don’t want a banana. You enjoy yours though. Ate it yesterday. Onto Xmas cake today. Very nice. A must see for Trump fans. Maybe Trumpy will get that wall after all? Gonna be interesting to see. If he gets part of it he’ll claim he got all of it anyway and they can all move on. His latest master stroke is to publicly claim that all those government employees who might not get paid for up to a year have said yes go for it Mr President we’ll happily have no money at all for a year so you can get your wall – which might be a fence in some places (or words to that general effect). Get that wall afterall. ? Lets see , after 2 years of full republican control of all 3 branches of government , zero extra miles of wall built. No full control of the Senate. Required Dem votes to block filibuster. False . They got the tax cuts by certain maneuvers via something called reconciliation- only useful when got control of the 2 chambers. Over the last 20 years, budget reconciliation has been used as a powerful tool to bypass filibusters and accomplish priority issues for the majority party with only 50 votes in the Senate. When President Trump was elected, we immediately moved to reconciliation in an effort to repeal ObamaCare…..
We’ve already been thru this. Reconciliation is very limited by restrictive rules and was not available for that Bill. The writer was a US Congressman and he describes a pathway using reconciliation- are you saying ‘You know more about that than him- How Trumpian of you. Mitch McConnell knows the rules better than anyone and he couldn’t get it through. Now stop being silly. Dooker, let me ask you a question: What is the first priority of any government? It’s something Jacinda doesn’t understand. And something Winston has sold out on. It’s something the 99% of voters don’t understand, believing looking after citizens welfare is the governments first priority. Getting re-elected seems to me to be the thing uppermost in their minds. And not doing what they said they would seems to be quite common when they work out that the number of people who voted for them last time might be more than the number of people who vote for them next time if they begin to worry that what they promised they would do had some unforeseen drawbacks. Yes, for our government that would be true, too. But not for Trumpy. But he didn’t ban Muslims, for instance, Corks. Do you think he’s going to? And he even seems very fond of the Saudis? He couldn’t ban Muslims if I remember correctly. Plus,he went off the deep end too fast in his desire to do something(👍.) He should have worked things out knowing the opposition he would face. A Muslim ban would be the biggest security gain any Western nation could achieve. Of course it will never come..even as innocent victims die. Political pragmatism at its best. Well, I really don’t see what the problem is with the Russia and China selling them arms. The Saudis would get a better deal pricewise. I read some where that Trump’s 500,000, then 600,000, then 1 million jobs from this deal (seriously, over two weeks that’s what he claimed!) is actually 20,000 jobs, the majority of which are in Saudi Arabia. Does it really matter who sells arms to Muslim countries if they’re going to just slaughter each other with them, anyway? Trumpy could do better deals with other countries, maybe Africa, or NZ. Knock the prices down. They’re hideously expensive and even if they’re precision munitions the Saudis just bomb buses full of kids & market places with them anyway. They don’t need that sort of precision. Also one of those cruise missiles didn’t bloody work. Megabucks down the dunny there. Hopefully Trumpy made McDonnell Douglas reimburse the military. Erdy and Putsie can tidy things up better than Trump in the ME anyway possibly. No pesky Congress looking over their shoulder complaining about civilian deaths. They may get a better deal. But US hardware is generally the gold stand. I guess its about keeping friends close..and enemies at arms length. The gold standard small arms is still the AK 47 I think. That’s Russian. F-16s are still probably the best value for money multi-role single engine fighter/bomber. But I dunno, maybe smart drones and smart missiles are the best way to go now. 99% of voters ? Where does that statistic come from? This blog and life in general. No one has answered the question yet. That should give you a clue. A clue to what, apart from the fact that it’s utter nonsense and that only you believe it ? Defence rests. You can move on now. Defence rests – i.e. it’s a meaningless exaggeration based upon nothing. Le Don and Der Bama are just symbolic leaders. They have no real power. Le Don and Der Bama are accidental leaders. The most preferred of the poor options available. The focus on Bama and especiallyTrump is media driven infotainment. Basically most Americans don’t have time for real politics. Polarisation sets up a simple them v us narrative. Some good points but ultimately incorrect. The GOP had no time for tariffs until Trump came along. Now he own’s the republican base and for the sake of their own careers and influence, the GOP reps have to follow where he leads. Mitch McConnell probably doesn’t want a shut down but Trump gave him one. Nothing Cocaine Mitch can do about it but smile and back his political master. Yes things shift a little right when the Reps get in and a little left when the Dems get in. Its an 8 year “correcting cycle” which pretty much keeps US politics on the same course. NZ is much the same. Although unlike the US we don’t have the formalised 8 years (Two term) Presidential cycle more like 6year -9 year -9-6-9 and the very occasional 3 year cycle. Again keeps views flowing from all sides and NZ too on course. 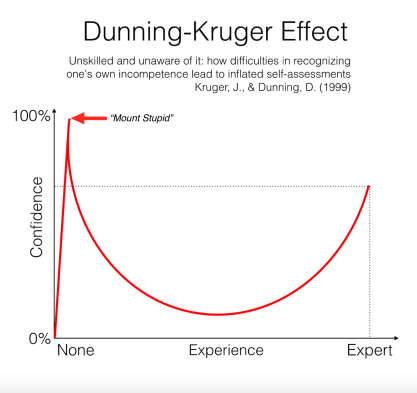 The Dunning-Kruger effect (also known as Mount Stupid or Smug Snake), named after David Dunning and Justin Kruger of Cornell University, occurs where people fail to adequately assess their level of competence — or specifically, their incompetence — at a task and thus consider themselves much more competent than everyone else. This lack of awareness is attributed to their lower level of competence robbing them of the ability to critically analyse their performance, leading to a significant overestimation of themselves. In simple words it’s “people who are too ignorant to know how ignorant they are”. As in: those who know the least about science are most convinced the science is settled.